In the midst of her racing at the Tasmanian Carnivals, I got a chance to chat with Maeve Plouffe, a professional track cyclist in Australia. 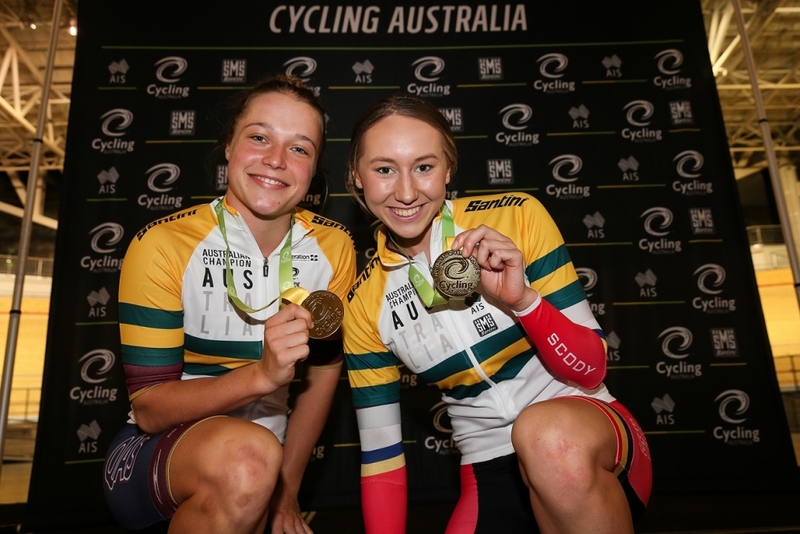 You might have seen Maeve winning the madison or holding the bronze medal in the 2018 Australian Track Nationals Omnium, where she came in behind the international powerhouses Josie Talbot (2) and Macey Stewart (1). I think this podium was a little foreshadowing that Maeve Plouffe might be the next Aussie we see sweeping the U.S. criterion scene or taking the best young rider class in the world tour stage races. Beyond talent, Maeve’s passion and positivity for cycling are contagious. Read my interview with Maeve below, and give her a follow @maeveplouffe on instagram to see her fantastic photos and watch her exciting career unfolding as one of Australia’s best. 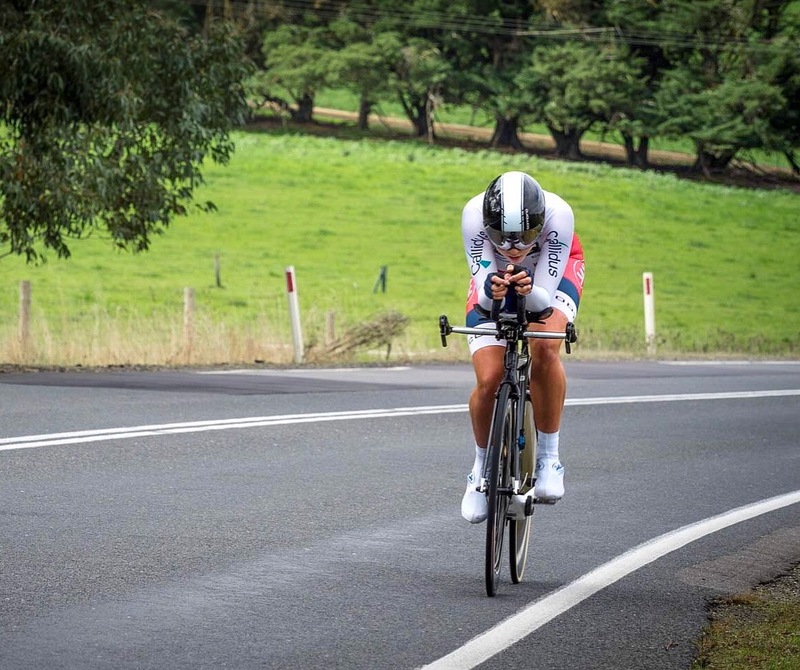 Q: The South Australian Sports Institute (SASI) identified you in talent ID testing as having the right skills to be a cyclist, how long ago was that? I was 13 years old. I started out as a swimmer, but decided to go through Talent ID testing because I was curious, and perhaps wanted to get into rowing. They identified me as a talent for cycling, but I wasn’t very keen on it. I decided to give it a go anyways. They gave me a track bike and a couple of training sessions and I loved it. I especially loved going fast on the bike and being on the track in general. None of my family was into cycling though, so the transition was a bit challenging. Eventually I started training with the triathlon team on the road and was grateful to have a triathlon group to ride with. 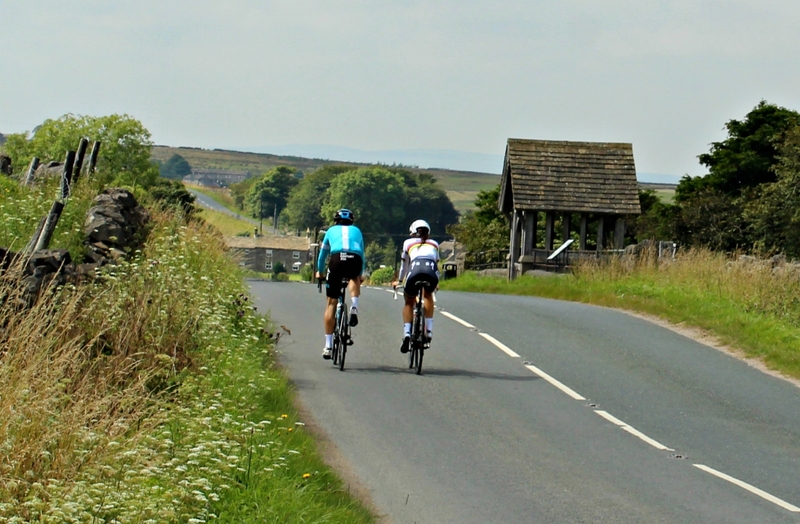 As a 13 year old girl, road training was a challenge without a group because being out on the open roads with little knowledge or experience was a bit daunting. Q: Did you race triathlon? I did one or two—I started out in open water swimming so I had the swimming and cycling down but wasn’t so good at the running. I did okay in my first few races but never really got into it. Q: How did your cycling career unfold after that? 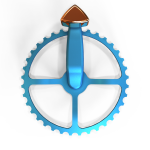 Cycling took hold in 2015 or so. I struggled on the national stages in my early years and wasn’t getting a lot of results, but when I was around 15 or 16 I went to my first nationals on a state team. I had no expectations—I’d never raced a national championship, but I had a lot of fitness from swimming behind my back. I won a silver medal and broke the qualifying time for entry into the South Australian Sports Institute (SASI). After that, I became a part of the SASI team and was given a coach, world class training, and the resources of a prestigious institute. SASI guided me through the last 3 or 4 years. Q: What changed with SASI? Moving into SASI and full-time cycling I started training 110 percent and wanting to do the extra hours and kilometers. I’d go out with a group and everyone would do extra, whereas in swimming it was more just do the workout and leave. Being in SASI was great for mentorship. I had a lot of women a few years above me with great experience. 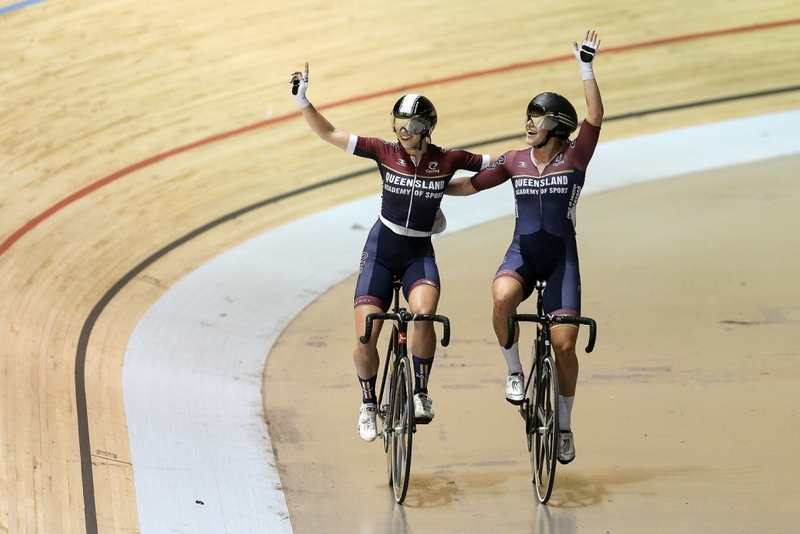 SASI also built a gold medal winning team pursuit team for the past several years—which is extremely valuable, considering it is quite rare to find four (or more) talented track pursuit riders in one state. Overall, it was great to have consistent training with strong, motivated women. This year I moved into the Australian Podium Potential Academy after my first UCI Track World Cup in October. Right now I’m training with the development group, but I get to train in the high performance facilities in Adelaide at the velodrome. It’s amazing because I’m fully supported as a cyclist and finally have no other concerns about working. Q: What was the biggest struggle transitioning to the pool from the track? I struggled with the tactics. I had a lot of fitness from the pool, I swam in the pool and ocean some ten times a week, plus running and other training. I had good training ethic, but I had no knowledge in cycling and wasn’t comfortable in big bunches. 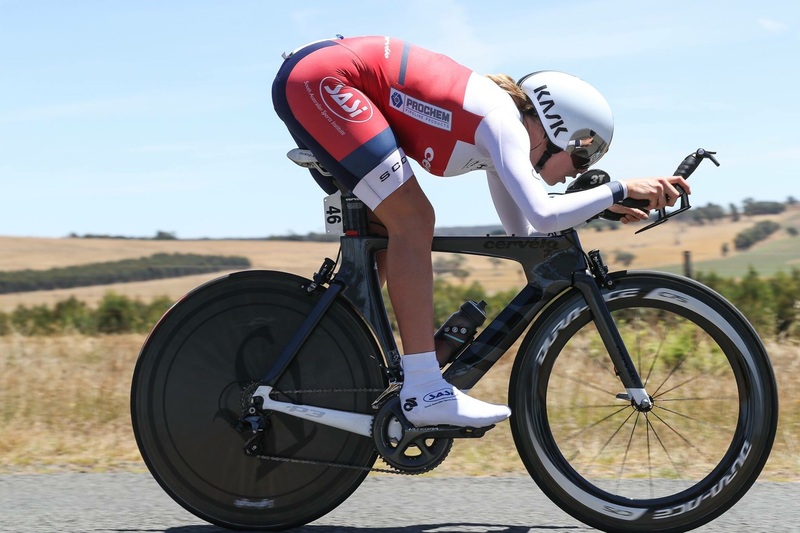 I started out quite strong in the time trial and won my first junior road national TT very quickly, but in fast and sketchy bunch races I would struggle with confidence, which was quite disheartening. After a little while I was actually looking for different options, but I stuck it out and the experience came around. It took a while, but I’m happy to be here now. Every time I move into a more advanced field I get that same feeling of being overwhelmed, like in the big international races. But I know confidence comes with experience and years of racing. Initially took about two years to get up to scratch in the junior field, and another year or two in the elite national field. I’m only just finding my feet in the international racing nowadays. Q: What do you think could help motivate other women that aren’t interested in cycling to give it a try like you did? What really got me loving cycling the most was the freedom it gave me. I didn’t see myself as a cyclist at first, and thought the sport in general looked a bit funny. However, once I got on a bike and realized I could use it to not only train, but to explore outdoors, I was hooked. Cycling is not a repetitive sport – it’s not swimming back and forth over the same black lines, or lifting weights every day. Training is different, we are doing long kilometres on the road one day, sprinting in criteriums the next, or pursuiting on the track. With a bike I feel as though I can go wherever I want. I can ride at any time of the day and get out and see roads and country I’ve never explored before. I also love the group of women I can connect and ride with. Adelaide has a great cycling scene. I’d encourage anyone that’s interested to give it a go. Whether it’s MTB, CX, road or track, there’s a discipline that suits everyone and their personalities. Sometimes finding a group to ride with as a woman starting out can be challenging – it’s no secret that there are substantially less female cyclists in the sport. I’d encourage women to not feel embarrassed or ashamed to ride with the boys, and to never feel like you are slowing them down! Everyone starts somewhere. If you’re lucky enough, you’ll find an awesome group of like- minded girls to push you in training and racing. Find someone who inspires you and connect! Q: Congratulations on the bronze medal in Australian track nationals. Did you think you might be on the podium going into nationals? My goal was to be on the podium. I’d been doing a lot of madison and team pursuit work, but going into the last race I didn’t think I’d be on the podium because I hadn’t done well at the beginning of the day. 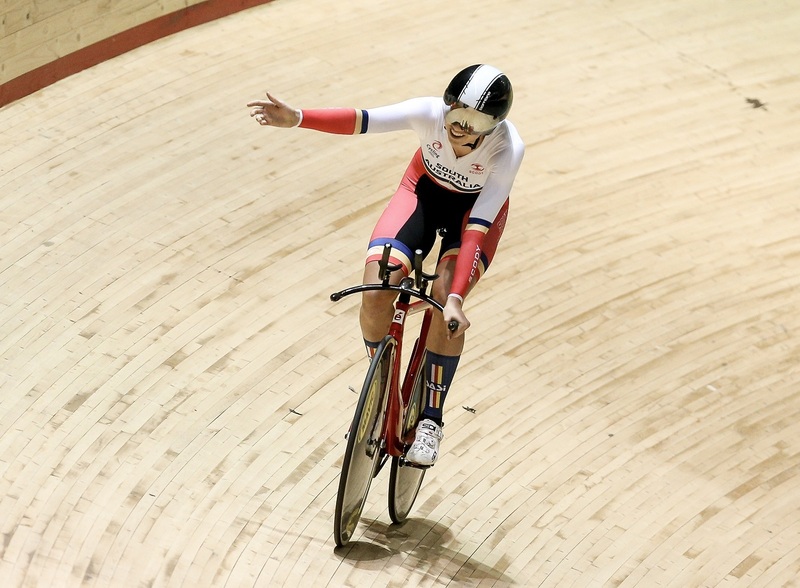 In the four races of the omnium, I’d had a couple of average races so I was really happy to pull a good result in the points race and get back onto the podium position. Q: I saw you on the podium recently as well in the Tasmanian Carnivals, how did that race play out? I was on the criterion podium in 2nd place the first race. The carnivals are fun, a few girls come down and it’s a whole week of races. Three of them are crits. I was second to Georgia Baker, who is a rider that I really respect and look up to so that was cool. Where might we see Maeve next? Q: Last year you raced in the Tour Down Under, did you like stage racing? Was that your first experience? It was my first UCI stage race, and actually my favorite race of the season. I absolutely loved it. The tour goes through my hometown of Adelaide so I grew up watching the race. I got a call up with the TIS women’s racing team and took the opportunity. I hadn’t done any road training before the race but I ended up 5th in the young rider classification. I’m not doing it because of my commitments on the track, I’m racing the Hong Kong World Cup. But I would love to race it again. Q: Any thoughts on giving a go in the U.S. criterion scene? I would love to go to the U.S. I was going to come this year (2018) but just started university and focused on the track so I kept this year a bit more quiet. I’m actually a Canadian citizen and I’ve always wanted to go back to Canada and race there. All the Australian women that go say it’s a really good experience and that the U.S. scene is exploding. I love crit racing and heard the culture in the U.S. is really fun. The girls seem to get a lot of recognition. I would like to race in the U.S. in June or July of 2019 so shout out to any teams there looking for a rider! Q: Any mountain bike races in your future? *laughs* Just for fun at the moment. Totally focused on track heading into the next Olympics. I’m a bit young for the next Olympics, but I’m still training as hard as I can. Track is the focus for the next four years or longer. Q: I saw your video on youtube about van life (check out the link in her insta profile)—did you travel the country in a van? Yes for a couple of weeks last off season. My boyfriend was competing in the commonwealth games and I had never taken a break off the bike before so we planned an off season trip. Took a little under a month and traveled along Queensland. I want to do more of that. My boyfriend bought a van now for the next off season. We are both so similar in that we love camping, exploring and low-maintenance kind of trips. In Queensland we ticked so many items off the bucket list, like the Barrier reef and waterfalls and all sorts of other cool experiences and locations. We also briefly did the Flinders Ranges in the van a few months ago, where we brought the mountain bikes. We saw some amazing things last year and I love our little van trips so I would like to do more if we can find the time off training, work and university between us. Q: Is video production a hobby of yours? I do have a little camera I carry with me and I love to take video and photos. I’m no professional but I like keeping memories. You’ll always see me with a camera. Q: What’s your favorite training route at the moment? In my hometown of Adelaide my favorite ride is the Saturday ride. We meet at 7:30 in the morning and ride for an hour along the beach for as long as we can hang on. The boys go as hard as they can and then the girls take turns switching off until we get dropped. Then we ride back easy and go up into the hills. By myself, I just do hill loops. Adelaide is great for road cycling and lots of good hills to pick and choose from. 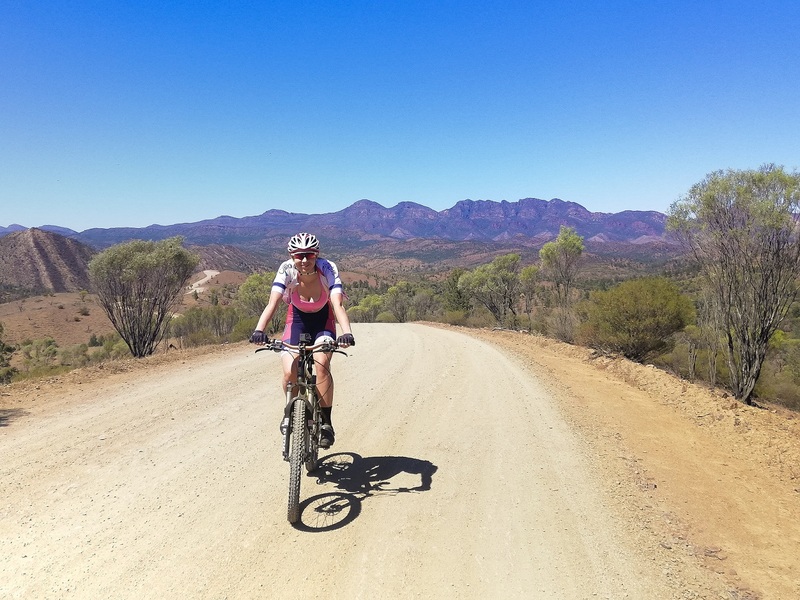 The coolest mountain bike ride was in the Flinders Ranges last year, it was about 50k long up these fire roads to Razor Back lookout. That was spectacular! I’m actually really bad because I don’t tend to eat on rides. I just take a banana, coffee mid- ride if that counts. Q: What is your coffee drink? I’d have to say Cappucino. I do love a milkshake in the Australian summer. Usually whatever I have in the fridge will do, but generally it’s a protein shake. Or a mango! You can follow Maeve and her cycling career and lifestyle, by clicking the link below. Our blogger and interviewer Hannah, also races competitively on the USA scene. You can follow Hannah on her own blog by clicking the link below.